The following is a history of Maple Leaf Lutheran Church’s involvement with the Maple Leaf School site. Maple Leaf School was built by the Lake City School District in 1926 and expanded in 1930. The school occupied the land between 32nd and 35th Ave. N.E., north of NE 100th Street. The school’s visitor parking lot was the wide street directly in front of the main building on the east side of 32nd Ave NE. Visitors parked their cars head-on, perpendicular to the street. Maple Leaf Lutheran Church was founded in 1946 at its present location, across the street from Maple Leaf School from which the church got its name. On Sundays, church visitors parked their cars in the Maple Leaf School visitor’s lot. School visitors occasionally parked their cars in front of the church. The Seattle Public School District absorbed the Lake City School District in 1954 when Seattle annexed Lake City. Most of the school parking “lot” became part of the Seattle street right-of-way. Maple Leaf Elementary School operated into the late 1970’s. The Renton Vocational Institute leased the school building from 1979 to 1987. The eastern half of the school site (the playground) was sold for housing development in the mid 1980s, and 16 houses were built there. In 1985, the church congregation spearheaded an effort to evaluate church, community-service and recreational uses for the beautiful 1920’s-era Maple Leaf school building with its wide hallways, high ceilings, tall windows, hardwood floors and gymnasium with stage. The church polled the community to gauge their interest in a multi-use Community Center. In May 1986, the church funded a feasibility study and wrote a proposal with site plans to turn the remaining half of the property into a shared-use church-community project called Maple Leaf Center. Those plans did not come to fruition for lack of interest and funding. After the Renton Vocational Institute vacated their lease in 1987, the Maple Leaf School building was neglected. The community was saddened to see it run down, vandalized and allowed to leak until it was a derelict in need of destruction. In January 1987, representatives from 47 community households met at the church with Marty Curry of the Seattle Department of Community Development to discuss a School Use Advisory Committee (SUAC) for the Maple Leaf School site. In December 1987 the District advised us that no SUAC process would proceed because the community did not show an interest in re-use of the school building for housing. In July 1988, the School District issued a Request for Proposals to sell the remaining half of the property (“Property for Sale, Maple Leaf School Site, Request for Proposals”, Seattle School District publication, July 1988). The District conducted community meetings at the church to solicit community response to the idea of converting the site to single-family dwellings. The church realized that it would lose the parking opportunities afforded by the present site, and the congregation expressed interest in buying a portion of the land for parking. Potential plans were drawn up, and both the community and the district acknowledged the need for church parking and gave their approval. Potential buyers would score bonus points in responding to the proposal if they included church parking in their plans. No sale was transacted at that time, and the site remained unused. In 1990, the School District tore down the Maple Leaf School building. In 1997, Cascadia Co-housing presented the idea of building multi-family co-housing on the site. The community did not approve of this. As with other dwelling options, the congregation wanted to purchase land for parking to ensure continued automobile access to the church. In 1997, the Meadowbrook Community Council Open Space Committee proposed turning the site into a wetland to foster wildlife, buffer Thornton Creek from flooding, and provide a recreational area. That plan was acceptable to the church. It called for approximately 60 parking stalls around the site perimeter, which would have nearly equaled the church’s parking usage, except during peak Sunday services, funerals, weddings and other large gatherings. Those plans were not carried out due to some community opposition and insufficient city interest and funding. 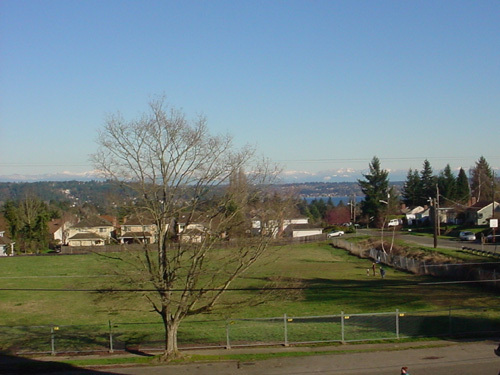 In March 2003, the Seattle School District returned to the idea of selling the Maple Leaf School site. 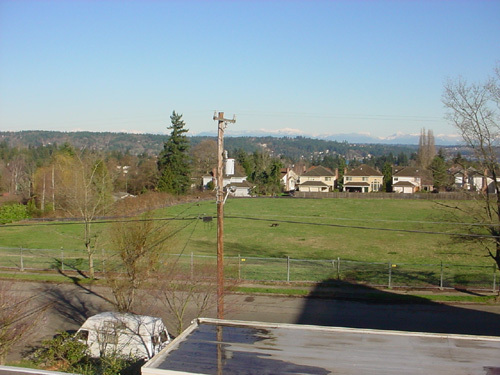 On 23 September 2003, the Seattle School District offered the Maple Leaf School site for sale. The first round of bids was due 21 October. The church made a fair-market-value bid for the western one-third of the remaining school site. That bid qualified the church for a second bidding round along with four property developers and another institution. The final bids were due 30 October 2003. The church bid on the western one-third of the property, but also made separate oral agreements with the four developers that they would sell the church that property if their bid were successful. Steve Williams Custom Homes won the bid and agreed to sell the church its portion at the church’s bid price, $1,020,000. On 5 November 2003, Maple Leaf Lutheran Church began a Capital Campaign to raise funds for property purchase and parking lot construction. The Capital Campaign commitments were completed on 22 February 2004. On 1 April 2004, the ELCA Mission Investment Fund made the church a loan for land purchase based upon the Capital Campaign pledges. The Maple Leaf School property was purchased from the Seattle School District on 15 April 2004.